Fitted nappies consist of a shaped, absorbent nappy, which normally requires the use a separate waterproof wrap. 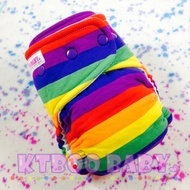 They come in either onesize/birth to potty or sized XS/Newborn to XL. Can be fastened with nippa (a plastic grip), poppers or applix.